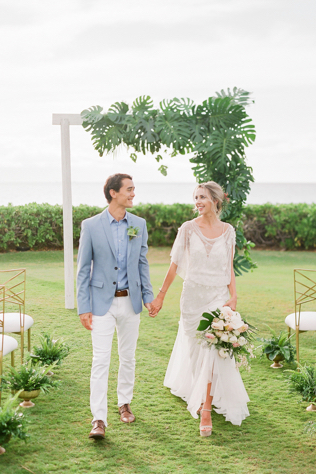 While some people want nothing more than to revel in the nitty-gritty details of wedding planning, most brides and grooms’ hearts race when it comes to beautiful inspiration. As a bride currently planning her own wedding, I find myself getting lost on Instagram and Pinterest imagining how to reinterpret the gorgeous images and ideas into my own big day. If you’re one such hopeless romantic, then we’ve got a treat for you. Photo shoots can provide straightforward inspiration in the form of fashion and details, but also inspire a certain feeling or je ne sais quoi. The setting is the Ocean Lawn at the Sheraton Maui Resort & Spa. Beyond beautiful views, the property is near Ka’anapali Beach and Black Rock Cliff; providing a stunning backdrop for a destination wedding and reception. A talented vendor team conceptualized a vision and brought it into impressive realization. Read on to learn more about the concept and the talented team who put it all together. For this styled shoot, Platinum Weddings & Events designed the space to be graced with the incredible floral design of Lois Hiranaga, who brought our modern, chic tropical vision to life. Elegance met island-style with the towering glassware topped with greenery and lush local flowers in shades of pale pink and whites. 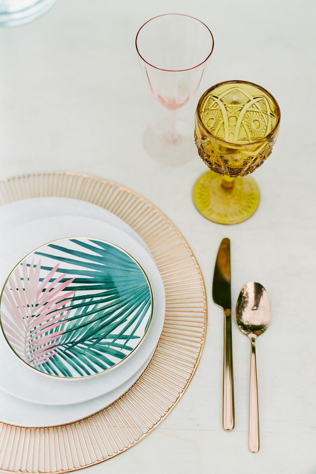 The look was pulled together perfectly with Set Maui + Table Candy's special touches of copper charger plates and flatware, cream dinner plates and blush and marigold glassware. 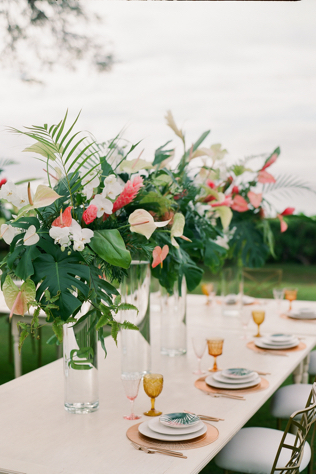 Complementing Signature Maui's whitewash farm tables perfectly, these place settings would make any bride long for a setting as incredible as this. The setting was captured beautifully by the soft lenses of Dmitri & Sandra Photography and All Time Media Productions.